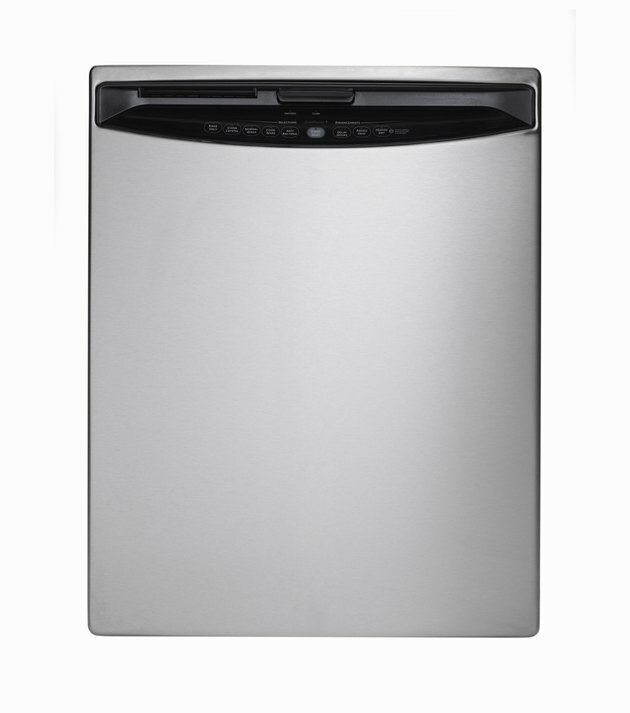 A Bosch dishwasher door is comprised of several different components. The front panel covers the electrical wiring and soap dispensers. There is a pulley hinge system for opening and closing the door, a front kick plate, and metal clips that hold the door to the machine. All these components must be altered or removed before you can remove the door completely. Once the door is off the unit, you can make repairs to it or to the front of the machine. Dishwasher doors are held in place by clips and hinges. Open the dishwasher door. Remove the top and bottom racks. Set the racks aside. Unscrew the screws holding the top panel in place. Pull the top panel off and set it aside, with the screws. Remove the two side panels by unscrewing the screws holding them in place, and set them aside. Close the dishwasher door. Pull the two plastic covers covering the hinges off the hinges. Grasp the plastic pulley holding the hinge in place with a pair of pliers. Pull the plastic pulley up to unhook it. Do this on both sides of the door. Open the door carefully, as it will be heavy without the hinges holding the weight. Hold the door halfway open, and pull the kick plate off the bottom of the washer. Open the door all the way. Unscrew the three screws on either side of the inside of the door, which hold the front panel in place. Close the door, and pull off the front panel. Push a flat-head screwdriver under the metal clip holding the door to the dishwasher on the right side. Pry the clip out with the screwdriver. Repeat on the left side. Pull the door away from the dishwasher.